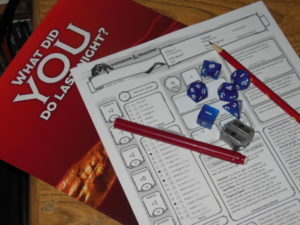 Summer of 2014 saw the release of the fifth edition of Dungeons & Dragons in a box set designed to introduce new players to the game. The box includes a rule book, an adventure book, pregenerated character sheets, and a full set of dice. It retails for $19.99. Create Your Character +0: The production quality of the box is fairly average. The dice are a nice, marbleized deep blue with bright white numbers. The rule books use thick, glossy presentation pages, and the character sheets are on heavy-weave linen. Both books are coverless, saddle-stitched jobs. 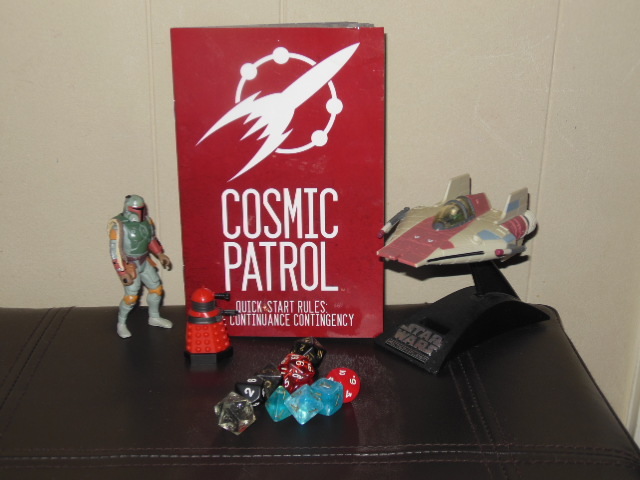 A 64-page rulebook and a 32-page adventure book. 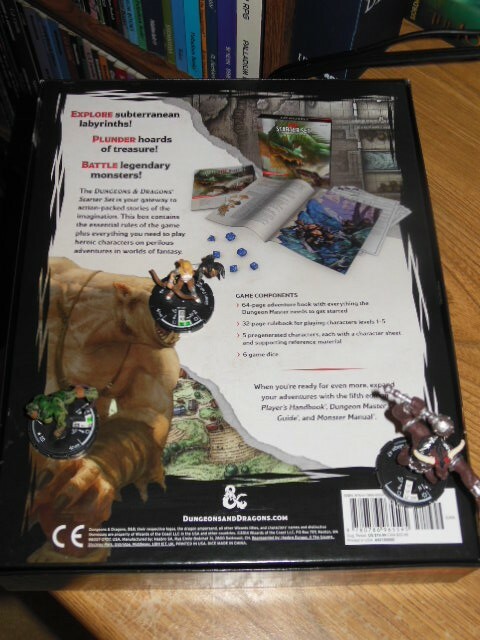 The included rules are meant to take characters as high as 5th level, and the adventure booklet maps out this structure very well. The box set plays as a quaint little self-contained game that will provide four or five complete gaming sessions. 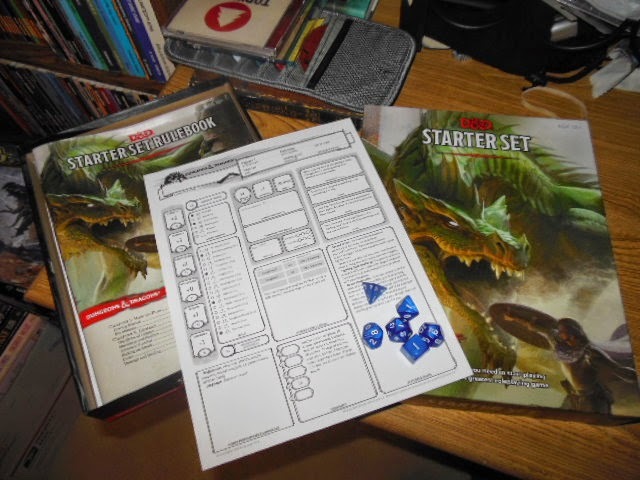 Roll for Initiative +3: Much of the violence and occult material has been removed from this starter set. Some mention is made of necromancy in the adventure material, and there is an encounter with a banshee. Magic is described as essential to the flavor of the Dungeons & Dragons experience, but the magic contained in the box emphasizes evocation, abjuration, and illusion – a power set that intentionally resembles super powers. 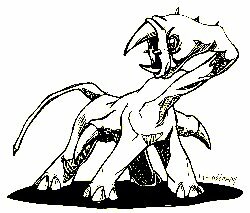 There is a nice variety of monsters to beat up, but the nastier or more horrific critters don’t show up. 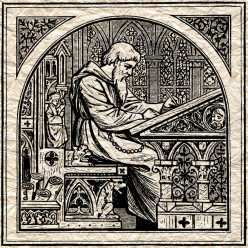 Attribute Modifiers +3: The new 5e rules scarcely resemble the 4e set at all; it feels much closer to the previous 3.5e rules. Character abilities have been trimmed significantly. Character level now provides a single proficiency bonus which applies equally to skills in which a character has proficiency, and that bonus caps at +6 for a 20th level character. Weapon usage is now a skill like any other; there is not a separate Base Attack Bonus. Characters receive attribute pumps and class features as they level but not Feats. Characters can now gain “advantage” or “disadvantage” as a situational bonus, taking the better of two twenty-sided rolls. Character creation includes occupation and background elements that help determine skill proficiency and provide “Inspiration” for characters to use during the game. All in all, the range of mechanical variation has been drastically reduced, allowing radically different characters to maintain parity of effectiveness and significantly reducing the amount of math involved. Saving Throws -2: I would have rather had a single, 96-page perfect bound book instead of two stapled magazines. A box set should have maps, and they missed an opportunity to include either maps of Phandelver Mine (useful) or a map of Faerun (sweet). I don’t even have to have the sweet, poster-sized treasures of yesteryear, full-page printouts would have been nice to have. It compares quite naturally to Pathfinder, but comes up short for a resolution system that feels dryly uniform. Armor Class +0: The dice are really nice, and this box is entirely self-contained. It’s a great introduction to role-playing games in general and Dungeons & Dragons specifically. The art direction is beautifully painted and epic in feel. The adventure touches all the elements of the genre, and is superbly constructed both for playing and to use as a model for your own scenarios. It compares quite naturally to Pathfinder, and the reduction of value ranges in the math means a pleasantly smaller standard deviation in execution. Roll to Hit: This is a great gift item for a new role-player or a board-gamer who wants to try something different. Experienced gamers won’t miss anything by leaving this on the shelf, and may be better served to just spend the extra money on the hardcover. On the other hand, the price point is low and it will definitely scratch that fantasy itch. Modified 14 on 1d20. The Challenge Rating System that Pathfinder uses is a holdover from D&D 3.5. This time around, Curtis and I dive into the math underneath building opponents and dig into where it works and where it doesn’t. We share some of our own observations, and offer up a more simplistic alternative – just go for it! Most RPGs are predicated on the 50% success rule. Heroes will succeed half the time they attempt a task. Fate Core takes a quantitatively different approach by predicating on the 100% success rule. Heroes are equal to any task which they attempt to undertake. The static skills test throws the differences between the two approaches into stark contrast and highlights the effectiveness of each. 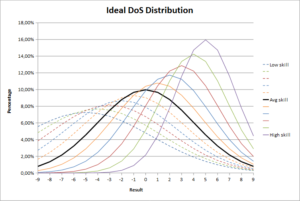 The 50% rule is seen most clearly in skill tests against a static difficulty. Pathfinder and the d20 games even have an option for players to automatically succeed at tasks within a certain difficulty range. This is known as Taking Ten or Taking Twenty because it assumes an average die roll. This type of mechanic evolved from the roots of the game as a tactical simulation, under the philosophy that success should be based on tactical choices rather than luck. When adapted for dramatic simulation, the die roll represents the effort of the characters in a very real way. Fate Core also includes the option to bypass the die roll in order to assume success of any static difficulty which is equal to or less than the character’s skill. We will call this rule “Taking Zero”. Like Pathfinder, it also assumes an average die roll. 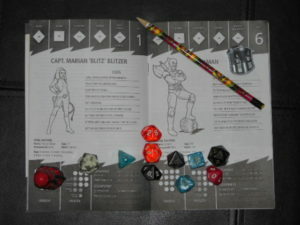 The Fate Core book instructs players that dice should only be rolled when the outcome is in question or degrees of success or failure will make the game more interesting. It is, in effect, the same rule. How does this change our approach to the game? If this were an exam, Pathfinder would be Pass/Fail, and Fate Core would grade on a curve. When you Take Ten or Take Twenty, your character may succeed at progressively more difficult tasks without undue stress. The opportunity is limited by the circumstances under which a character may choose to Take Ten or Twenty. If your skill is insufficient, you simply fail at the task. Another solution must be found. The key difference lies in the way that Fate Core penalizes failure. By Taking Zero, your character succeeds at a task, but there is a minor cost. That cost may be expressed as a small penalty to a future action or as a complication within the story. But in Fate Core, success is always an option. Did your character fail the skill test by three shifts? No problem. He succeeds, but the price is progressively higher the greater the extent of failure. This changes our approach to the game by allowing the characters to always succeed at static tasks but at the cost of future complications. Because the Fate Core system relies primarily on dramatic simulation rather than tactical simulation, the penalty for failure is seldom as straightforward as the loss of Hit Points. In this way, characters accrue penalties and complications to be leveraged against them during the course of the game. 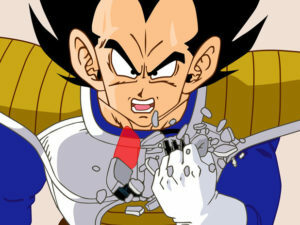 Because later penalties are directly related to previous success, this form of resolution creates stronger storytelling by using a callback to previous events. It is one of the tenets of circular storytelling. In the early game, characters trade initial success for a more difficult challenge down the road. The easiest way to do this is to apply the cost of Taking Zero as an Aspect against the characters that opponents can tag for free in the late game, we’ll call this Stacking Consequences. But this is Fate, and players may well wish to bank negative Aspects which they can tag for Fate points when they start to run low. In the mid game, Taking Zero keeps the characters on track and prevents derailing due to unexpectedly difficult challenges. It works the other way around as well. When prepping for the endgame, players can accept higher difficulties when Creating Advantages too be used later. 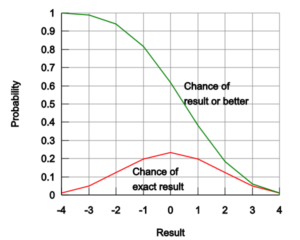 In this case, a die roll is still required, but a quick glance at the probability chart shows that even when the target difficulty number is zero the chance of success on the die roll is about 60%. In the endgame, this principle prevents the action from getting bogged down when a single task becomes critical. Fate Core has a related mechanic built into the system; characters may concede a conflict and retain some control over their fate. Extending this concept against static skill checks lets players essentially “concede” to the difficulty of the task and continue to participate in the story even when their skills have failed. Taking Zero and conceding a conflict both manage the difficulty of an adventure as it progresses. If the point of the game is to move the action forward and keep the party from getting bogged down in the details, you will find them to be essential tools in your GM toolbox. 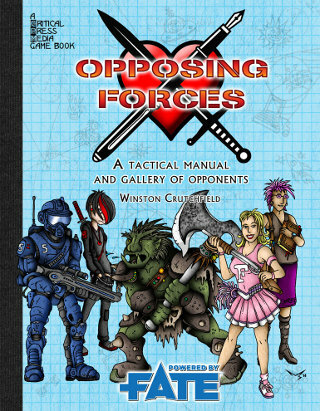 “Opposing Forces” is a tactical manual and bestiary of foes for Fate Core. Now funding on Kickstarter! Check it out!